Paliokαlias Naoussa is a dry red wine made from 100%Xinomavro.This noble variety is cultivated in a special wine region in Naoussa called PALIOKALIAS and offers a limited production of this fine P.D.O. wine.The climate of this area features warm with dry summers and mild winters. For most of the day the vines exposed to the full benefit of the sun. 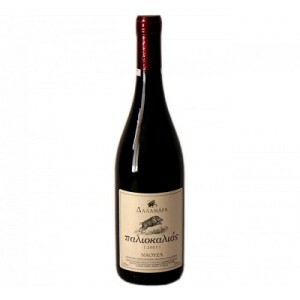 It is aged in oak barrels for 12months and accompanies perfectly red meat and wild game. It needs a few hours of breathing before it becomes smoother and welcoming. Served at 16-18o C.
“Paliokalias” is without cold stabilization and unfiltered so a small amount of sediment at the bottom of the bottle is normal.